Hi all, I'm currently looking at getting a new strap for my superocean, it's the blue face version so my first thoughts are to get the blue rubber strap. (I'm drawn to the blue as the face of my watch is blue). Then I find out that they come in two blues, dark and light , next I think there are three designs (maybe more), but I definitely don't like the one with the large round holes (racer version I think). I then try to goggle some images of the superocean with a rubber strap however there aren't that many pictures out there. Here's where you guys come in, I'd appreciate if you could post me some pictures of your watches (preferably the superocean) with a rubber strap. Here's mine on a Pro 2 rubber strap. Very nice, is that the black strap? 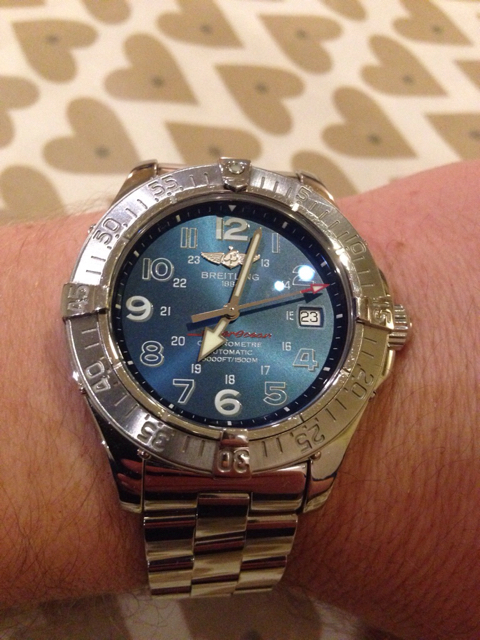 Also is this the strap which doesn't have Breitling written around the side? Yes, as the watch face is black. The outside of the strap is smooth, the word "Breitling" appears on the inside (very discreet). They both look great. I think I've seen one with 'breit' on one side and 'ling' on the other side? The blue does look great, is it just one blue version that they sell? I think I've seen one with 'breit' on one side and 'ling' on the other side? Original Diver Pro, tang only and discontinued years ago. I think I've seen testo-max here one with 'breit' on one side and 'ling' on the other side? I like the blue strap. It looks more modern. I think I've seen crazy bulk here one with 'breit' on one side and 'ling' on the other side? I`m more for black staps to be honest.. They both look great. I think I've seen Enfinmince.fr one with 'breit' on one side and 'ling' on the other side? so..anyone with pics of some leather straps? please share!